Bali Surfing Lets surf at serangan beach where popular beach in Bali! In this course you can try surfing with gentle and fun wave! 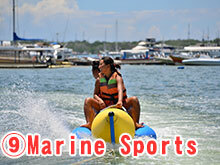 Also you can try marine sports after surfing such as Banana boat and parasailing and more! After marine sports we will take you to your choice of spa treatment for healing sunburned skin. 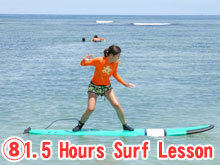 Easy 1.5 hours Surf Lesson! Serangan surf school opened in 2011. The location is in Serangan island where popular surf spot in Bali. In this surf lesson, start from surf lecture by instructor then paddle out until 100～150m from coast. 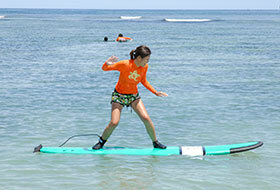 Surf Instructor will support your first time surf, so you do not need any worried. It is easy wave for beginner! 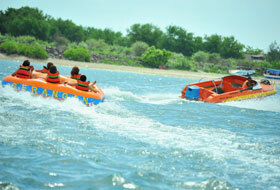 Serangan island is also popular marine sports spot. Serangan island is one of the popular marine sports spot, but there is no crowded as Tanjung benoa or Kuta area. It is recommended for guest who want to enjoy with calm and quite. Enjoy the 3 hours spa after surfing！ Lets heal the sunburn skin and massage for muscle！ We selected Popular spa among in Bali. There are various kind treatment which non oil massage for mens and more for ladies. You can choose your favorite marine sports from the free choice list instead of the ones in each course. Please choose activities in the points each course has, If pointsgoes above the limit, you can buy it 1 point=＄1. （ex： Marine Pack B Free Choice has 84 points, so you can try Parasailing (14p) + Snorkeling (Nusa Dua) 1 hour (21p) + Introductory Diving (43p). ・You can buy the point as １Point＝＄１ if you need additional point. No available for cream bath those customer who wearing hair extension. You can not change the menu on the day, please notice it. ※You can not choose「Tanah Lot Temple＋Kecak Dance Tour」,「Uluwatu Temple＋Kecak Dance Tour」 If you choose Queen Rose. ※You can not choose「Tanah Lot Temple＋Kecak Dance Tour」,「Uluwatu Temple＋Kecak Dance Tour」 If you choose Kubu Bali Spa. 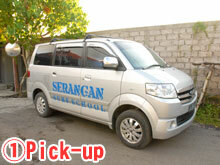 ※Ubud area transport fee is different by each spa.